The Palms is located in a very desirable residential neighborhood in SE Cape Coral Surrounded by very high end properties close to the Caloosahatchee river. Lots of quiet streets to walk, run or bike through. This seasonal vacation rental property has been extensively remodeled and features a lot of upgrades. On the exterior, one immediately recognizes the 18 mature palm trees that line the entire property, there is a paver walkway around the entire perimeter of the home. The salt water swimming pool has been added on in 2016 and the privacy curtains are a fantastic option to either turn the backyard into a very private oasis or to open it up for a great view of the neighborhood. 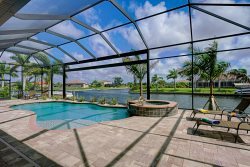 The over sized lanai features an electrically heated swimming pool and spa, the perimeter of the swimming pool is lined with blue glass tile which reflects a beautiful color when the sun rays hit the water. At night the LED lights in the swimming pool and spa with its various light modes turn the pool into your own private light show. Whether you chose to relax in the pool, spa, the outside lounge or by the exterior dining room table, there are plenty of options. The property itself features three good size bedrooms each featuring a king size bed with tempur pedic mattresses. The master bedroom is located on the left side of the home with its own en suite bathroom while the two guest bedrooms are located on the right side of the property sharing a good size bathroom, which als serves as the pool bath. The dining room is equipped with tasteful furnishings as well as the main living room, which features a large couch as well as two recliners. For the guest that likes to stay in touch with work while on vacation, a little work station completed with office desk and chair has been provided. The Palms ist eine wunderschoene Ferienvilla, die sich im SE von Cape Coral in einer ruhigen Nachbarschaft ganz in der Naehe des Caloosahatchee Rivers befindet. Schon bei der Aussenansicht des Hauses faellt auf dass das Haus mit seinen 18 Palmen sowie einem Laufweg in Pflastersteinen rund um das Haus sorgfaeltig in Stand gehalten ist. Der Hoehepunkt dieses Ferienhauses ist das ueberdimensionale Pool Deck. Mit einem "privacy curtain" kann der komplette Terrassenbereich in eine Private Oase in nur wenigen Minuten veraendert werden. Der erst 2016 gebaute Swimming Pool mit Whirlpool ist elektrisch beheizt und ist ein Salzwasser Pool. Mit seinen LED Lichtern und verschiedenen Farbeinstellungen hat man am Abend seine eigene Light Show auf der Terrasse. Das Pool Area ist mit einem grossen Esstisch und 6 Stuehlen sowie einer separaten Lounge und Liegen ausgestattet. Das Haus selbst verfuegt ueber 3 Schlafzimmer, 2 Baeder, Esszimmer, Wohnzimmer sowie einem kleinen Office. Jedes Schlafzimmer hat ein King Size Bed mit Tempur Pedic Matratze. Das Elternschlafzimmer befindet sich auf der linken Seite des Hauses waehrend die beiden Gaestezimmer auf der rechten Seite des Hauses sind. Das Gaestebad dient gleichzeitig auch als Pool Bad.